For ages now I’ve had the idea to write a post about use-by and best before dates on packaged food. But I haven’t been able to think of a recipe that fits with the theme. I’ve also been meaning to share with you one of my all-time favourite desserts – a simplified version of something my Mum used to make. But I didn’t really have a meaty topic to talk about, so it has also been languishing in my inspiration file. Fortunately, I realised that they might make a perfect mis-match. So here we are. First the sweets. A posset is an old fashioned cream-based dessert that is kinda like a creamy panna cotta without the gelatine. I’m a little hazy on the chemistry behind how it works but basically you dissolve some sugar in cream, simmer for a couple of minutes. Then stir through some lemon juice, pour it into serving dishes . Refrigerate for 6 hours or more. A perfect do-ahead dinner party dessert, it tastes far more sophisticated than it sounds. It transcends the seasons. I’d be just as happy eating it in the height of summer as I would on a cold winters night. I wasn’t kidding about the panna cotta comparison. It mightn’t have the holy ‘wobble’, but that won’t be worrying you when you have a spoonful of this silky, creamy lemon-fresh melting on your tongue. Yum. When I finished university and started my first job as a food scientist, I was fascinated by the process of determining the shelf life of products. There were all manner of fancy simulated tests, but as I quickly realised, the only real way to know how a product is going to change over time is to keep a few packets and taste them as time progresses. Simple but time consuming – especially if your product is expected to last for a year or more. what’s the difference between best before and use-by? Best before tends to be used on products that have a longer shelf life like cereal or chocolate biscuits. The intention is to give you a guide but in most cases, if the product hasn’t been exposed to extreme heat and is unopened, it will still be edible. There are subtle changes such as loss in flavour that occur over time, so it may not taste as good as a packet fresh off the factory floor, but not enough difference to warrant wasting good food. Use-by, is usually associated with shorter shelf life, more high risk products like milk and eggs. In this case I tend to obey the use-by date. Although I have been known to risk milk in my tea after it has expired and sometimes it’s fine (say if the carton has only just been opened) and of course then there are the times where it’s in date but makes a curdled mess of your tea (usually because someone has left the milk out of the fridge!). Which reminds me – trust your instincts. Just because something is in date doesn’t mean it’s 100% safe – if it smells funny, ditch it, regardless of the date. how do best before dates get chosen? I’m not familiar with the process for shorter life products like meat and milk. But I assume there is extensive testing both of changes to flavour, appearance and microbial populations to determine the use-by time period. For things with longer shelf lives, like cereal and chocolate biscuits, I’ve been actively involved. Basically a whole heap of the product is placed in room temperature (and sometimes other temperatures as well) storage. Samples are taken on a regular basis and evaluated for appearance, texture and flavour until the desired shelf life time has passed, or the product becomes unacceptable for sale. The time period is then chosen based on how the product has performed. Generally there is a safety margin built in of a few months. So if the product started to show signs of flavour loss or other undesirable attributes at say, 8 months, then the shelf life would be set at say, 6 months. how do I know if something is still safe to eat? Trust your instincts. In most cases food will start to show visible signs of spoilage before any terrible disease causing bacteria get going. So if there is mould or fungi, or if it smells funny it’s probably a good idea to ditch it. But if it seems fine, it probably is. If you’re feeding people who may have sensitive immune systems like pregnant ladies, children or anyone who’s been ill, it’s probably best to play it safe. how do I maximise the shelf life of my food? I could write a whole post about this. But there are 2 key things to think about for maximising the shelf life of your ingredients: temperature and exposure to air. As a rule of thumb, the cooler things are, the longer they last. So it’s a good idea to make sure your fridge and freezer are working properly. And if possible, have your dry food stored in the coolest part of the kitchen. Of course not all ingredients are best refrigerated, especially some veg. For a guide to optimum vegetable storage, there’s a post I wrote earlier in the year. Exposure to air plays a few different roles. In dry goods like cereal, once you open the packet and air gets in the cereal is likely to pickup moisture from the air. Oxidation is another result of air exposure, just think of the difference between a whole apple and one that’s been cut in half. For moister products like yoghurt or sauces, exposure to the air means exposure to bacteria and fungi which can lead to spoilage of your food. This is why an unopened jar of tomato paste can sit on the shelf for years but only lasts a few weeks (if that) in the fridge once you’ve opened it. I’m happy to eat a large serving of this, but if you just want something small to finish a larger meal, it’s probably a good idea to use small cups and share it between 4. Feel free to play around with the citrus. Lime is lovely and my Mum’s version was a wonderful combination of lemon and passionfruit. So good. I’ve made this with thickened cream and pure cream. While both are good, I prefer to avoid the thickeners and stick to pure cream. But feel free to use thickened if that’s all you have. 1. Place cream and sugar in a saucepan and simmer gently for 3 minutes or until sugar has dissolved. 2. Remove from the heat and stir in the lemon juice. Divide between 2 – 4 serving containers. 3. Refrigerate for 6 hours or until you’re ready to serve. 4. Sprinkle with a few almonds and serve with a small spoon. Small question, when do you add the lemon juice? When cream and sugar already boiled but are still on the fire, or after? A friend of mine used to say to her kids “Best Before does not mean Poisonous After”. I pretty much work on that principle too! The thing I find spookiest about the modern world, though, is how long the milk keeps… my mother always made scones with the “off” milk, but now we never seem to get any. thanks for the pickup random & foodandfashion. I’m so loving your 5 ingredient posts – it makes everything you post seem so manageable! Milk and Dairy: The date on a carton of milk is a sell-by, meaning the last day a store can legally sell it. It should be good, if it’s still un-opened and has been properly refigerated for one week after this date. No matter what the date is, use it within a week of opening it. This applies to yogurt, juice as well. Eggs: I have no idea why the codes on eggs are so short. Most studies show that, properly cared for, they are good for months past the date on the carton. The fact that so many young, single males survive their bachelor years is testament to this! Meat: This is very subjective. If your market packs-out and wraps steaks, chops, and poultry pieces in-house, they are given a short – usually 3 day – code, and pulled in to be checked if they don’t sell. Most are still wholesome and are re-wrapped and re-priced. The only meat product this should never happen with is ground (minced). The grinding process makes it far too easy for bacteria to be introduced. Can’t wait to try this beautiful recipe, either! Is it possible to make a substitution for the refined sugar? I’m trying to put more distance between sugar and me. I’m a new subscriber. Love your recipes! I’ve never heard about posset, but it sounds amazing! I love the limited-ingredient recipes! Please keep them coming. Thanks for the inside information in use/best by dates! I’d love to know more about what temperatures are safe for storage. My lkitchen has serious storage and temperature issues, mostly in the too hot, very moist, not enough fridge space direction. Sounds so yummmy and thank you, thank you for the five or less ingredient recipes!! I have a New Giveaway from the French Basketeer and I think you will love it! I’m so sorry your posset curdled – I’ve been making it for years and it’s never happened to me. You did the right thing adding the lemon juice straight away. It must have been something to do with your cream. What type of cream did you use? Was there any chance it could have been close to its use-by date? absolutely you could use whatever sweetner you like – the sugar is just adding sweetness to balance the acidity so you could use another sweetner if you like. In Australia milk is meant to be used by the date on the carton. But I agree with you on the short shelf life on eggs. I often eat them after their use-by and there’s no problem. But I do keep my eggs in the fridge. And thanks for pointing that out about ground (minced) meat. marie, i totally agree about the eggs! they last waaay beyond the date and you can tell immediately when they are bad, so i generally ignore the date. when i worked at a shelter 90% of the food which guests and staff ate was past the sell by/ best by/ expiration date and we never had a bad outcome. stores throw out millions of dollars worth of eatable food every day because of those dates, luckily some donate it to food programs in their city. we were careful to store the food in the fridge or freezer (even bread so it wouldn’t mold) and to trust our gut about throwing away anything with an off smell or color (especially meat) but i and the 100s who ate with us are a testement to the fact that those dates are guides, not rules! Is exposure to light also a factor in the life of food? I’ve heard with things like oils that you should get the dark brown bottles to reduce the UV light that they are exposed to. I wonder if that’s the case with fruit and veg too? Most stores are actually afraid to donate – they’ve been warned that they could be sued if someone got sick. Sad comment on our mind-set, isn’t it? Most dairies will pick-up and exchange for expired milk – they use it for sour cream and cottage cheese! That dessert looks delicious and thank you for the info on expirations. Regarding eggs I never bother with the dates either. I never even look at the ‘dates’ and I can only remember coming across rotten one in my entire life. I’m not a huge egg eater so they must keep pretty well. @ kylieonwheels – I have also heard that about oils and as far as I know it is best to store them in a cupboard rather than on a bench. That way they aren’t sitting there exposed to the light all the time. Also, I was just reading Jules’ other post on vegetable storage (you can find a link in her post above) and it should answer you question for veges I think – not sure about the fruits though. I haven’t ever heard that fruits should be kept in the dark. I made this while I was roasting some tomatoes this morning for my breakfast before work. I ate it when I got home after work. It’s one of the best desserts I’ve ever eaten, without a doubt. When I was living in France I knew someone who worked in the food testing laboratory for Yoplait and they told me that yoghurt is fine up to a month after it’s use by date providing it has been kept properly refrigerated. I’ve tried this and have not had any problems. I’m a first time commenter and just want to say I love your concept and have already cooked the onion pandade for a vegetarian friend of mine and am hot footing it to make the lemon posset tonight. Many thanks, please keep them coming. @Rachael – does that go for all yogurt do you think or just the store bought and sealed up ones? I’m just wondering whether it has something to do with preservatives added. Or am I being too cynical? :) I make my yogurt – then again I have never tried making it and then not opening it up!! I think this recipe was made just for me. I bought 2 organic lemons yesterday, I have 1 small container of heavy cream with an expiration date for next week, plus 4 brand new ramekins. I can’t wait to try it out! I’m fairly new to your blog and I’m loving it. 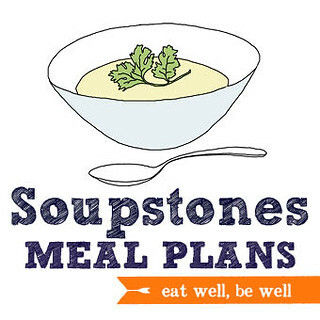 The concept, the outlook, the recipes – so glad I’ve found Stonesoup! Also, I’m very grateful for the metric measurements! 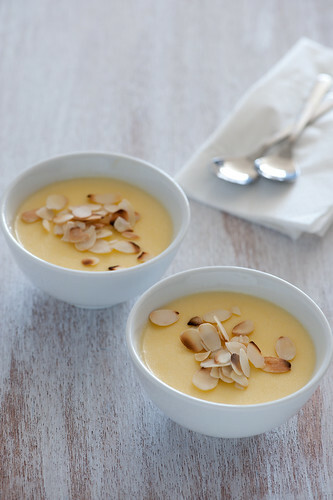 I made your lemon posset for our dessert yesterday, it turned out sooo delicious – thank you for sharing! This is fantastic. Simply fabulous. I’ve only sneaked spoonfuls here and there because it’s still cooling, but the lemon takes just enough edge off of the sugar and yummmm….Incredibly moreish already. I won’t get much of it, and I’ll want all. Just found your blog today. Looks very interesting, looking forward to more reading. I keep hearing and reading about posset. Must try it because it seems super easy to make. Wow I never knew that foodstuffs were still edible past their “Best Before” dates. Thanks for the tip! Hello! I’ve been an avid reader of your website for a while and remembered that I’d bookmarked this recipe as an easy make-ahead dessert option. Well I just made it and it’s absolutely delicious! I can’t believe how well it thickened up. Would it be OK with you if I blogged about it (with full credit to you, of course)? Would this recipe work using Equal or Splenda? I am diabetic and are always on the look-out for suitable recipes to convert. I think it would work with splenda.. but I don’t have much experience working with artificial sweetners. The acid is responsible for the setting so it should be fine. Happy accident finding your blog! Are there any suggestions you could make for doing this dairy free? Would coconut cream work as a substitute for the cream, maybe? I’m a bit unsure on the exact chemistry involved. Love the sound of it…Cant wait to try!!! This dessert sounds wonderful, for a special treat. I really loved reading about shelf life of products. It reminds me of when I was much younger and my mother had a can of apricots that had been sitting in her cupboard for 20 years or so. The can was okay so she opened it, and both my sisters ate the apricots. They were a bit discolored, but were otherwise just fine. Personally, I had no interest in trying something that old. This was probably in the days before they put expiration dates on products, but it makes clear the fact that many times those dates are subjective. Shelf life of panna cotta? Good luck with the food blog Zen! 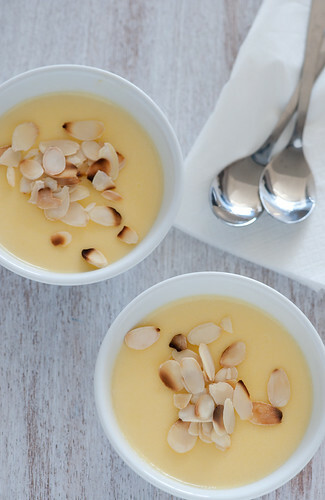 How long does the lemon posset last in fridge after making it.